Autumn is nature’s showiest time of year. In Virginia, as in other states, lush, green forests give way to the unmistakable colors of fall – with leaves in many parts of the commonwealth reaching peak right about now. There’s nothing quite like the season’s display of fiery colors against the deep-blue autumn sky. It’s a sight to see, free of charge – and there’s perhaps no better place to see it than in Virginia’s Shenandoah region. Here are just a few of the many ways you can get outside and take it in – all of which are made possible by the unsung wonders of natural gas and oil. No list of Virginia highlights, scenic drives or other places for magnificent fall foliage is complete without Shenandoah National Park’s signature Skyline Drive – so we put it right here at the top. This National Scenic Byway comprises 105 miles paved with asphalt, a petroleum product made with asphalt cement. Both chlorophyll and carotenoids are present in the chloroplasts of leaf cells throughout the growing season. During this time, chlorophyll is produced and broken down and leaves appear green. As days get shorter, chlorophyll production slows down until it stops. The green color is no longer visible, and other pigments present (carotenoids) with the chlorophyll are then revealed. During autumn, bright light and excess plant sugars produce anthocyanins [reds] within leaf cells. A lot more on leaf color here, from the U.S. Forest Service. As you travel the crest of the Blue Ridge Mountains, Skyline Drive’s 75 scenic overlooks will have visitors reaching for their cameras or smartphones. Whatever device you choose, capturing those picture-perfect views is made possible with the help of petroleum-based plastics, which make up their outer casings, and aluminum (made from natural gas), used for batteries and other internal components. 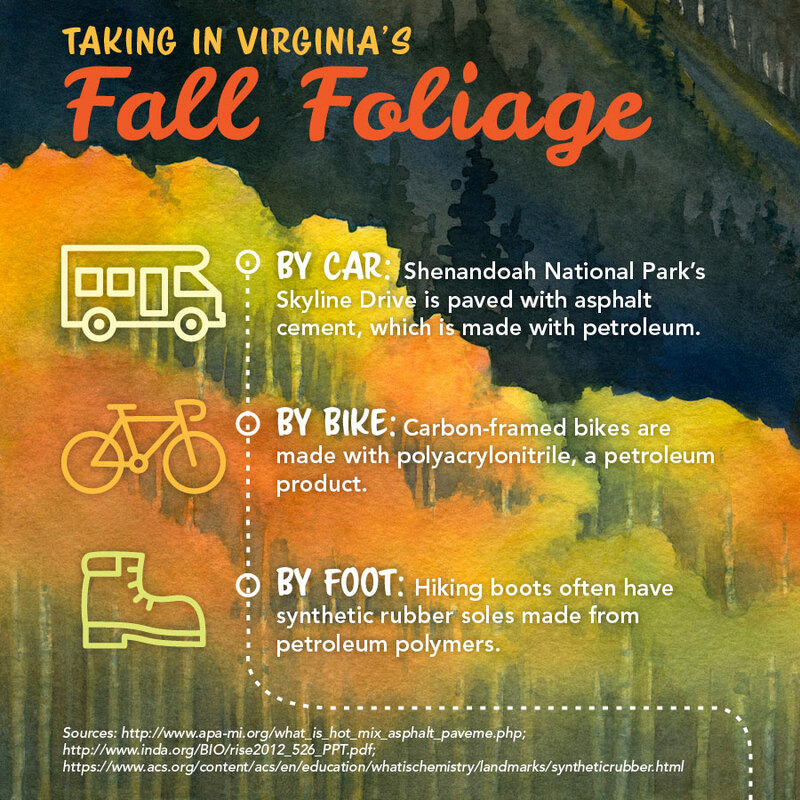 If you prefer to take in the scenery on two wheels instead of four, check out Staunton’s Shenandoah Valley Fall Foliage Bike Festival. Considered to be one of the best fall bike rides in the country, the Fall Foliage Bike Festival offers a full weekend of riding through the beautiful Shenandoah Valley. No matter which of the nine routes you choose—from the 13-mile Family Loop to the Century ride—you’ll take in stunning vistas of the Blue Ridge and Allegheny Mountains in full fall color along the way. This year’s Bike Festival is scheduled Oct. 20-22. Bike riding also is made possible by energy – and not just the energy you supply! Most bike frames are made from composite materials, including the ultra-light carbon-fiber frames made of polyacrylonitrile, a petroleum product. The bike’s tires wouldn’t exist without petroleum, which is used in all of a tire’s components – including the tread, which is made from a blend of natural and petroleum-based synthetic rubber. Meanwhile, petroleum-based lubricants keep a bicycle’s drivetrain cycling smoothly. With more than 500 miles of hiking trails in Shenandoah National Park, it’s impossible to mention them all. But, if you’re up for peaceful trek with a great reward, Robertson Mountain, not quite an hour west of Culpeper, is billed as one of the park’s most scenic – and least visited – summits. Whichever hike you choose, you’ll want to wear shoes with the flexible traction you need to safely traverse the trails. That’s why hiking boots are made with synthetic rubber soles, a product made from petroleum polymers. Feeling energized about viewing some fall foliage? What are you waiting for? Choose your Virginia adventure and head for the hills!